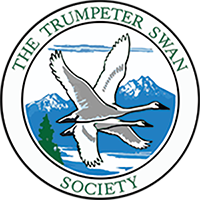 Trumpeter Swan survival is based on a foundation of strong family bonds and crucial learned patterns of habitat use (traditions) acquired by associating with older more experienced birds, usually family members. Trumpeters may live 20-30 years in the wild. They usually maintain very predictable annual movement and habitat use patterns unless faced with a significant habitat change. In turn, they teach these patterns to their cygnets. Pairs usually mate for life and return each year to the same nesting wetland, often using the same nest mound. Eggs are laid in late April through late May, depending on the spring conditions. There is an average incubation period of 32-34 days. Cygnets hatch in May through June. After gaining flight in September, cygnets follow their parents to their wintering area and learn its resources and hazards while they remain with their parents through their first winter. Cygnets often remain with their broodmates through at least their first year and may regroup with their parents at the usual family wintering site in subsequent winters. These strong family bonds help cygnets continue to learn key migration routes and food resources from more experienced adults. Trumpeter Swans may form pair bonds as early as their second winter and some may nest for the first time at three years of age. Most Trumpeters, however, don't nest until they are four to six years old. Like other waterfowl, Trumpeter Swans molt all their flight feathers during mid-summer and are completely flightless for about a month. During this period they are particularly vulnerable and may act more secretive than usual. Most Trumpeters lose substantial weight during the winter. The weeks prior to nest initiation are a crucial period for rebuilding internal energy reserves. During this period in early spring, when wetlands are often still frozen, the females must find rich pre-breeding food sources to replenish their internal reserves for the energy demands of egg laying and incubation. When Trumpeters were reduced to near extinction, the damage was much greater than simply the great decline in numbers. Crucial knowledge of traditional migration routes and winter food sources was also lost. Recreating that knowledge is one of the greatest challenges in the effort to rebuild secure populations. Harry Lumsden, who led Ontario's Trumpeter Swan Restoration program, describes some typical swan behaviors and what they might mean.